Valentine's Day is less than a month away. It is time to order your gifts! Below I have compiled a list of 10 Affordable Valentine's Day gift ideas for her. While these are not super cheap Valentine's Day gifts, they are very affordable, all coming in at well under $100. I hope you find that perfect something! Happy shopping and have a wonderful Valentine's Day! This elegant 14-karat gold plated kate spade bangle bracelet is engraved with the words “Heart of Gold.” The bangle comes in a drawstring storage pouch which will make the perfect presentation as a gift. Perfume always makes a wonderful gift, and this Wonderstruck Eau De Parfum Spray from Taylor Swift is the perfume to gift this year with its vibrant scent and pretty purple and gold bottle. These sparkly little Michael Kors Heart Stud Earrings are sure to brighten any girls day. With pave-embellished borders and the Michael Kors logo, they are just stunning! They come in silver, gold, and rose gold. Decisions, decisions! This white and gold polka dot wallet from Fossil is super cute! A heart-shaped key chain comes with the wallet, making it a perfect gift for Valentine's Day! Tell her how much you love her with this beautiful necklace featuring a two-piece moon pendant engraved with the words “I love you…to the moon & back.” The pendant sits on a box chain with an easy to open spring-clasp. This necklace comes in silver, rose gold, gold, or two-tone. She is sure to enjoy relaxing after a long day in this Satin Robe from iCollection Lingerie. The robe features three-quarter sleeves and an adjustable sash at waist. It comes in 9 beautiful colors including pink, red, ivory, black and purple. This Romantic Set of Mason Jar Candles from Way Out West features two long lasting soy wax candles – a Romantic Rose Candle and a Raspberry White Chocolate Candle. The cute little heart accents are the jars and the red and pink color combination make them a great choice for a Valentine's Day gift. If your sweetie has a sweet tooth, I recommend treating her to some delicious Milk Chocolate Dipped Oreos from Olde Naples Chocolate. These treats are decorated perfect for Valentine's Day and are truly irresistible! The Nautica Women's Pink Watch features Quartz Movement and is water resistant up to 330 feet. It comes with both pink and white straps, making it a 2-in-1! Who doesn't love a 2-in-1? If your gal is a coffee-lover, why not give her this adorable Gold Hello Love Heart Mug? Every time she enjoys a nice hot beverage in this generous 14oz ceramic mug she will be reminded of you and how much you rock for giving it to her! The perfume bottle is very pretty. Haven’t smelled it before. I would totally like any of these gifts. I love the cup and necklace best, though. I wouldn’t mind receiving each of these. Thanks for sharing! 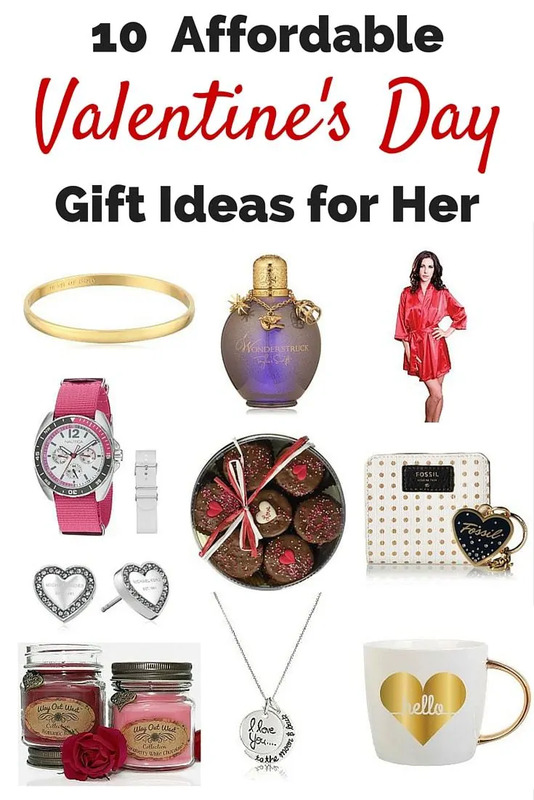 I love all these great gift ideas; my favorite is the Nautica Women’s Pink Watch.